The University of Central Florida will honor and remember our nation’s veterans with several events throughout November. This year’s events will provide the Central Florida community with opportunities to hear stories shared by veterans, learn about resources and programs available, and support local veterans’ causes. Ranked as one of the nation’s best universities for veterans and “Military Friendly” by G.I. Jobs magazine, UCF also provides student veterans with dedicated resources to aid them on their path to graduation. Below are a select number of activities for this year’s Veterans Month. A complete list of events can be found here. Thursday, Nov. 1— Veterans Month kicks off with the Central Florida Yellow Ribbon Project. As a community art movement, this project involves “fiber bombing” trees with yellow cord to increase awareness of homeless veterans. A donation drive will take place during November to collect nonperishable food, clothing and toiletry items. All items will be donated to the Homeless Services Network of Central Florida. This project is curated by Art & History Museums – Maitland, in collaboration with the UCF Community Veterans History Project and the Veterans Academic Resource Center. To learn more about the Central Florida Yellow Ribbon Project and find donation drop off locations, click here. 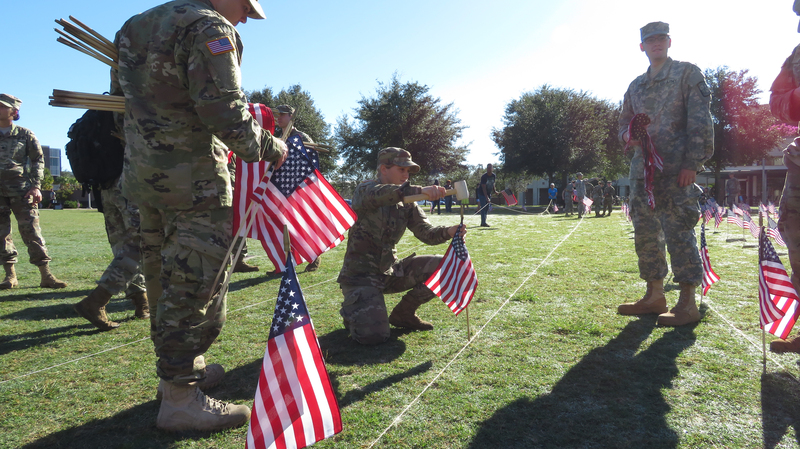 Wednesday-Friday, Nov. 7-9 – The UCF Veterans Academic Resource Center will honor university student veterans who are attending classes during the fall semester by planting more than 1,300 American flags on UCF Memory Mall. Learn more here. Wednesday, Nov. 7 – Stories of truth and courage will be told by U.S. veterans as part of “The Many Colors of Courage: Voices of our Veterans.” This production combines multimedia interviews with live performances in Visual Arts Building 132 at 6 p.m. Listen to personal testimonies and get an intimate look at the pride and pain of military service. UCF’s Facebook will live stream the event. Additional details can be found here. Thursday, Nov. 8 – The seventh annual veterans commemoration ceremony honors veterans from all service branches and all conflicts. Presented by UCF History, UCF Community Veterans History Project, UCF Veterans Academic Resource Center, UCF Air Force ROTC, UCF Army ROTC, and UCF Music. The public is invited to gather at the Veterans Commemorative Site on the campus’ Memory Mall at 11 a.m. for the ceremony. Friday, Nov. 9 – The Veterans Academic Resource Center will celebrate the 243rd birthday of the United States Marine Corps with cake and ice cream. Test your Marine Corps knowledge with some trivia questions at the VARC lobby from 2 to 3 p.m.
Friday, Nov. 9 – Undergraduate students studying military history will interview local World War II, Korean and Vietnam veterans to capture their experiences using oral history through the UCF Community Veterans History Project. The interviews will be at Westminster Towers in downtown Orlando from 9 a.m. to 4 p.m. Learn more about the UCF Community Veterans History Project, here. Tuesday, Nov. 13 – Open to UCF student veterans, more than 15 employers will attend this year’s VetConnect to give direct interviews and provide networking contacts. If you are thinking about starting your job search, looking for a career, or just need to freshen up on your elevator pitch, this event is for you. Check out the VARC website for updates on how to RSVP. Space is limited, so register early to attend the event, which will be at UCF Career Services from 3 p.m. to 6 p.m.
Thursday, Nov. 29 – “Bringing their Stories to Life: The Veterans Legacy Program at St. Augustine National Cemetery” showcases the research and discoveries of UCF Department of History and the Center for Humanities and Digital Research faculty, staff and students as part of the National Cemetery Administration’s Veterans Legacy Program initiative. This event will take place at St. Augustine National Cemetery, St. Augustine, Florida, from 10 a.m. to 12:30 p.m. Learn about this program here.